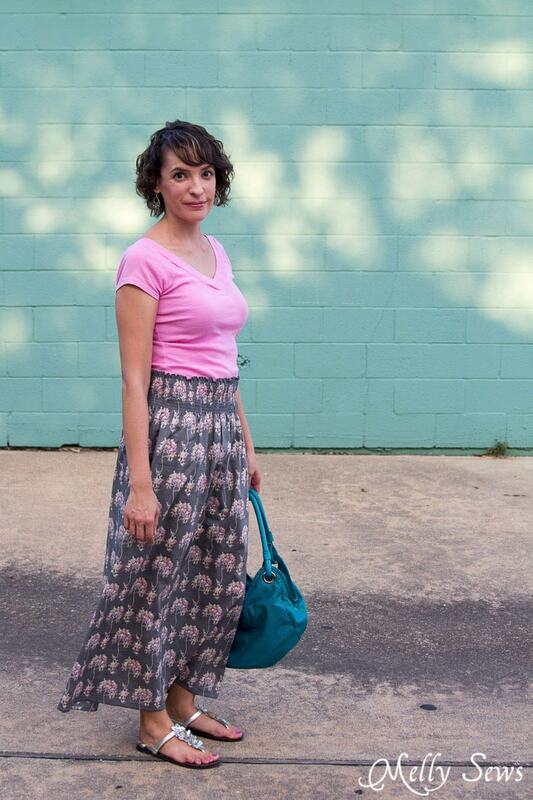 Hey y’all, today I have a SUPER easy skirt tutorial. 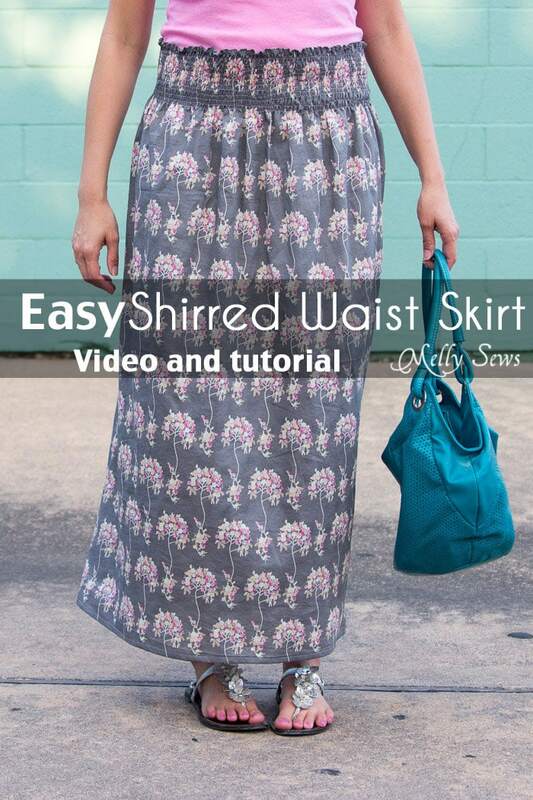 I’m going to show you how to sew elastic thread to make a stretchy, shirred waist skirt. These are awesome because they’re easy, you can make them in any size or length, and you only need 2 supplies – your fabric (I used Tree Fleur Voile by Francis Newcombe) and elastic thread (affiliate link). A note on fabric – you don’t want to use anything too heavy for this – the elastic won’t be able to gather or shirr heavy or stiff fabric enough to hold it up. I’ve got a video tutorial on how to do this below. If you prefer the written tutorial just scroll on by the video. And if for some reason the video won’t play, you can also watch it on YouTube here. So first sew your skirt panel into a loop with the circumference equal to 1.5 times your waist measurement. 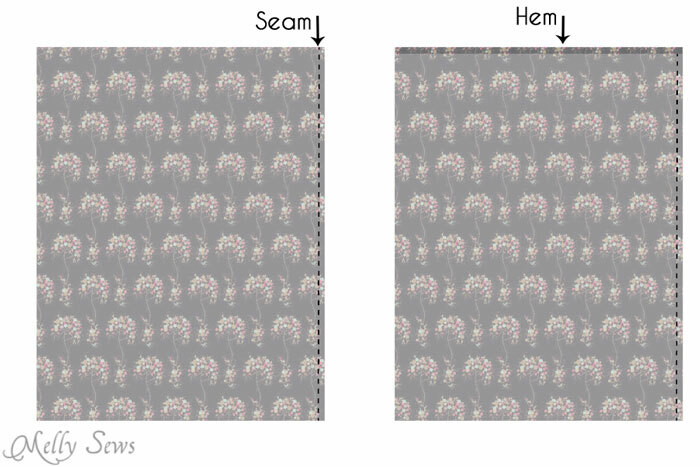 You may use one panel folded in half or two panels sewn together at the sides, depending on the length/width you need. Finish these seams. Then fold the top edge of the skirt 1/4 inch to the wrong side twice to form a very narrow hem. Press and stitch the hem in place. 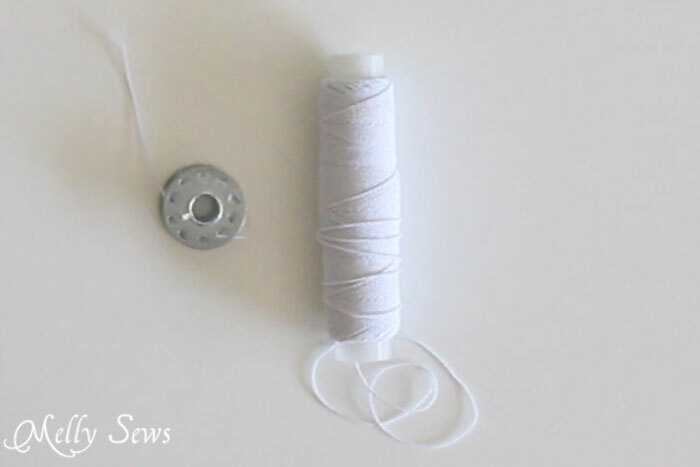 To sew with elastic thread, first load a bobbin with it. I used this elastic thread (affiliate link); I’ve also heard good things about the Guterman brand elastic thread. Many tutorials on sewing with elastic thread tell you to hand wind the elastic thread, however I’ve always had better results on my drop in bobbin machine by using the machine to wind the elastic. Some say that side loading bobbin cases are the ones that should be hand wound, and that may be the difference. Your upper thread will be the regular thread you use, and it should match your fabric since you’ll be sewing right side up. Next, when you load your bobbin in your machine, you want to make sure you’ve pulled the bobbin thread up through the throat plate. 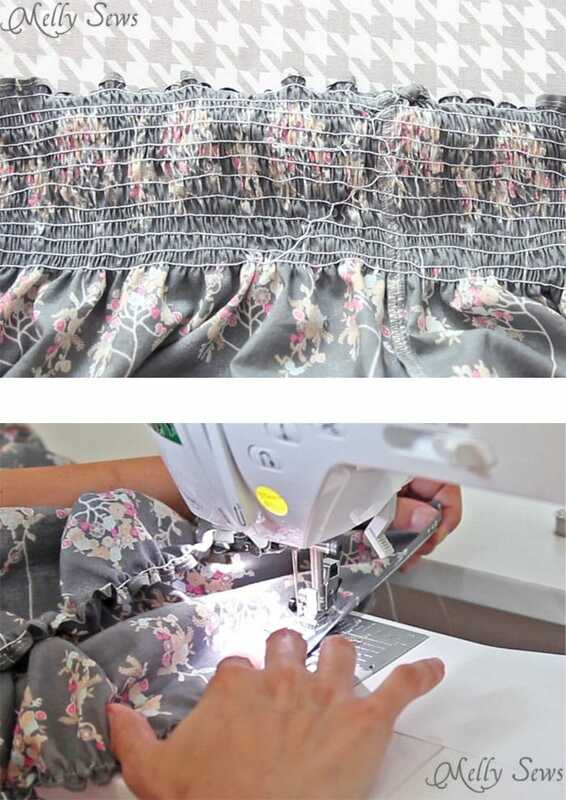 To do this, hold the upper thread in one hand and hand crank the machine. Sweep a pair of scissors under the presser foot if your hand won’t fit. 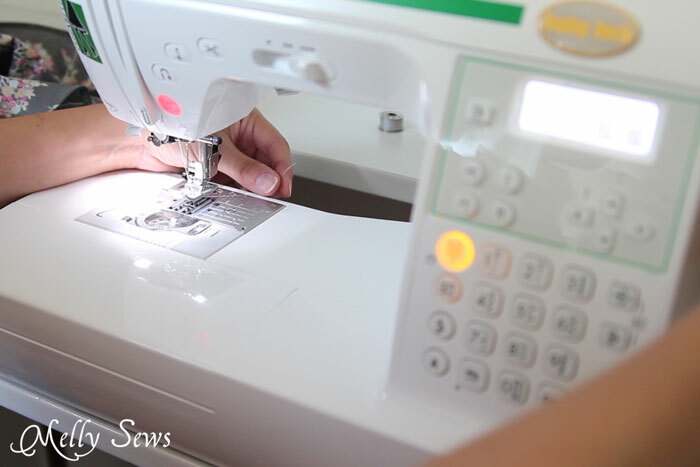 Finally, lengthen your stitch to the longest one your machine will do and leave your tension set to normal. IMPORTANT NOTE: This is a technique I really encourage you to practice on a scrap before attempting it on a garment. You’ll want to know which winding method works better for your machine, and also how much your fabric will shrink when steamed. So I would suggest cutting a 10 inch wide scrap and practicing the stitch, then steaming and re-measuring to figure out how much it will shrink. Then all you have to do is sew lines on the skirt for about 3-5 inches from the top edge. Overlap each line a few stitches and then pick up the needle and presser foot and move the fabric over to stitch the next row. I use the edge of my presser foot as a guide to line up each row. As your fabric starts to gather, make sure to stretch it flat as it goes under the needle. 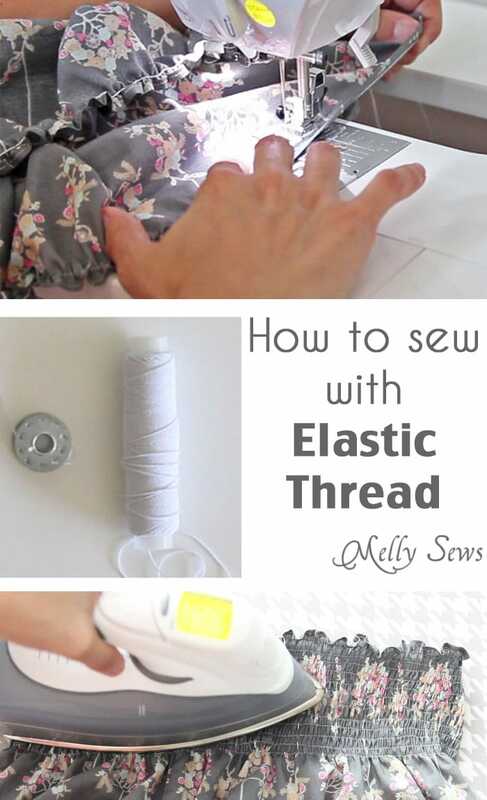 You don’t want to sew pleats into the fabric, you want the elastic thread to do the work. Leave long thread tails to tie them on the back side of the fabric. When you are finished sewing the lines, tie off your thread tails, then steam the elastic thread to get it to shrink up. 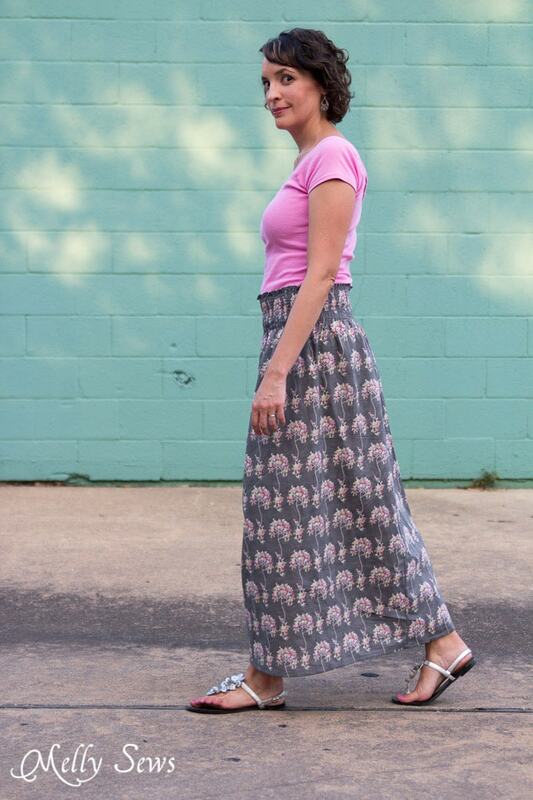 Add a hem to the bottom edge and that’s it – stretch and wear! Great tutorial and easy to follow! My grand daughter loves shirred sundresses but the fabric is ridiculously priced unless on clearance. Sundresses, here we come! Its so simple and effective. 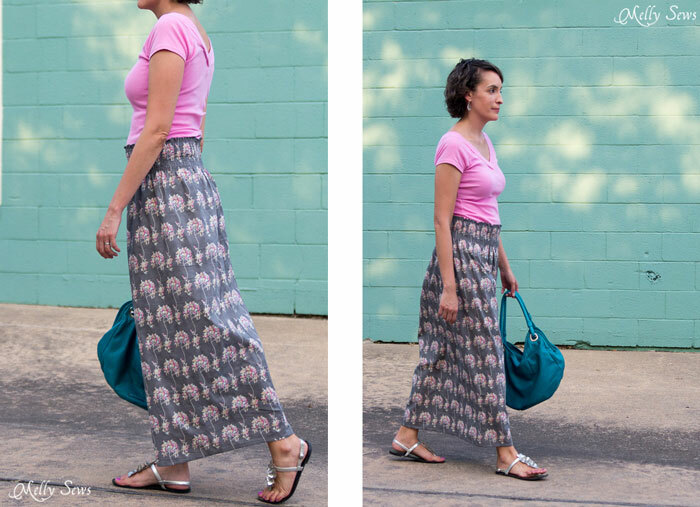 My sewing classes have to do a maxi skirt using 12cm wide elastic as the waistband. This idea we decided we didn’t like. So now they’re shirring the waist and they’re loving it. 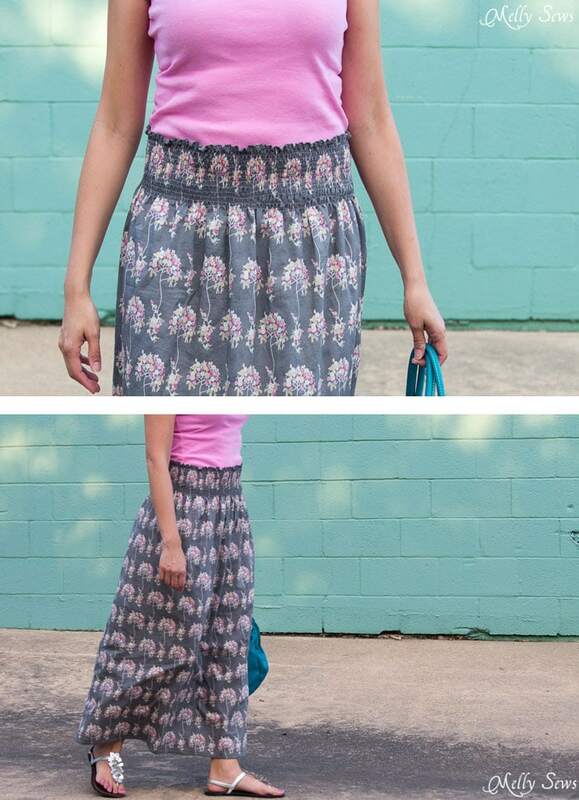 Its so appropriate that you should have featured this skirt, this week. 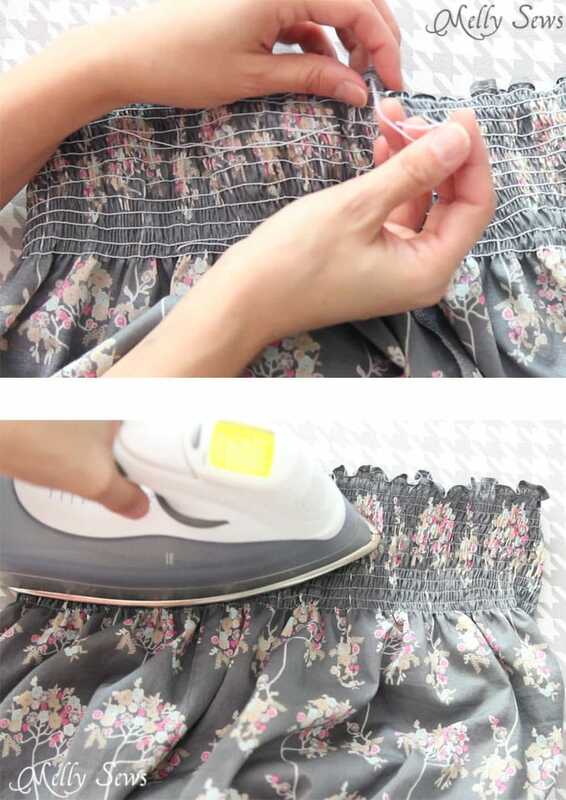 Very good for beginner sewists. I want to try it with the waist of pants. My daughter saw some she liked. We’ll see how it goes. 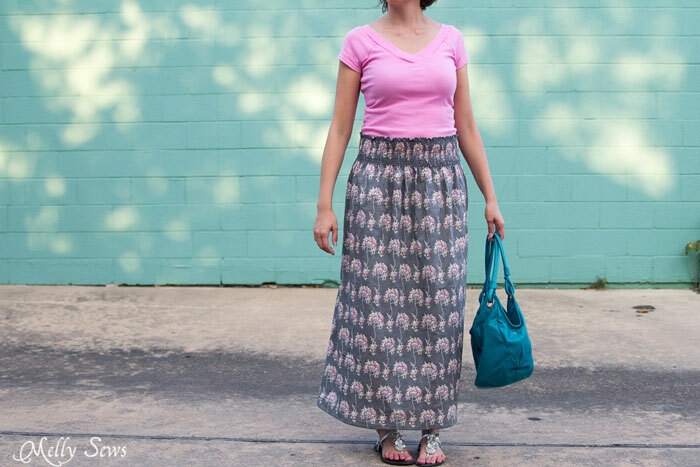 Hopefully they will look as marvelous as your skirt! Oooh, I want to try this! I recently saw a cotton sundress that had elastic shirring on the back bodice panel, on either side of a central zipper. It was a nice way to allow some fitting flexibility in the dress. I was wondering how to re-create that look. I watched the tutorial video and I am totally inspired, thank you so much !!! I am so glad you share it all with us !!! I always love to watch your videos you are such a great teacher. I love you sewing machine at the ease of treading it. Thanks to your clear instructions, I feel ready to try this technique. This a great tutorial for elastic thread! I’ve not ever tried sewing with this elastic thread but may just have to try a sample piece, just so I can get some experience! Your skirt is cute too! Melly, thanks so much for this tutorial. The last time I sewed anything that looked shirred was a pair of pants. However, it had three separate channels to use regular elastic in each one. That was almost 45 years ago. Do you think this would work on a circle skirt? Have you posted anything about circle skirts, ii.e. patterns, tutorials, fabric recommendation? I want to make one for my daughter and one for my grandaughter before Christmas. I made the mistake of going to your store “just a look” stopover. Well, 6 patterns later, I left. I went back to get the knit winter hat, I wish I had known you had posted it as a freebie. ,Love the pattern and it was worth every cent I paid for it. I wish I had just a smidgen of your talent. Thank you for all the sharing of patterns and tutorials. Without that, it would mean whether I buy a pattern one month and the fabric the next, or vice-versa. You have a wealth of knowledge and you’re sweet to share.